Known for their progressive take on contemporary design, offbeat French fashion house Maison Margiela was originally established in 1988. The quirky design house creates menswear classics with an idiosyncratic twist that echoes the deconstructionist philosophy of the labelâ€™s founder Martin Margiela. 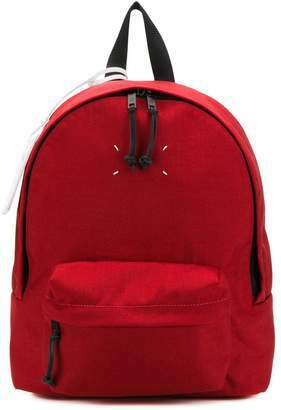 Presented in a vibrant red tone, this medium backpack from Maison Margiela boasts a top handle, adjustable shoulder straps, a hanging leather tag and an all-around zip fastening that opens up to a main internal compartment with a printed lining.